Arashiyama is an area just out of central Kyoto, also known as Sagano. The river Hozu passes through this area, and contributes to give this place a very special atmosphere. 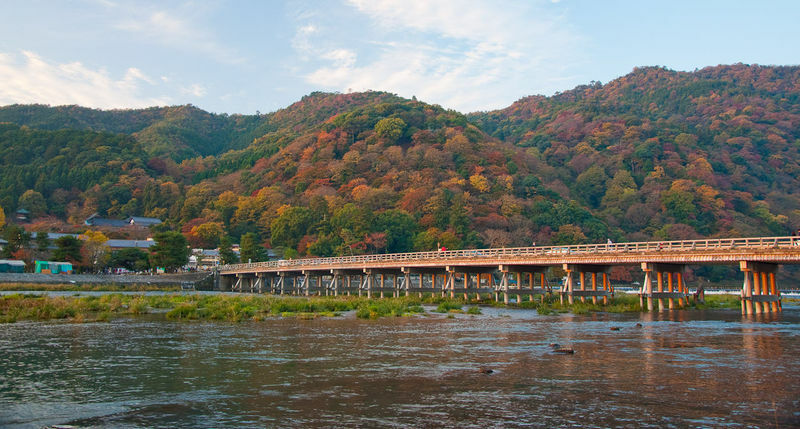 One of the many bridges across the river is a landmark of Arashiyama, namely the Togetsukyo Bridge (which literally means "bridge that crosses the moon"), from which you can admire a wonderful panorama, especially with the colors of autumn and spring. Near the bridge there is the most famous temple of the area, the Tenryuji. The most important temple of the whole area, it is considered one of the "Five great Zen temples of Kyoto" and it is also an UNESCO World Heritage Site. It is a fairly large complex, belonging to the Rinzai Buddhist sect, consisting of several buildings. 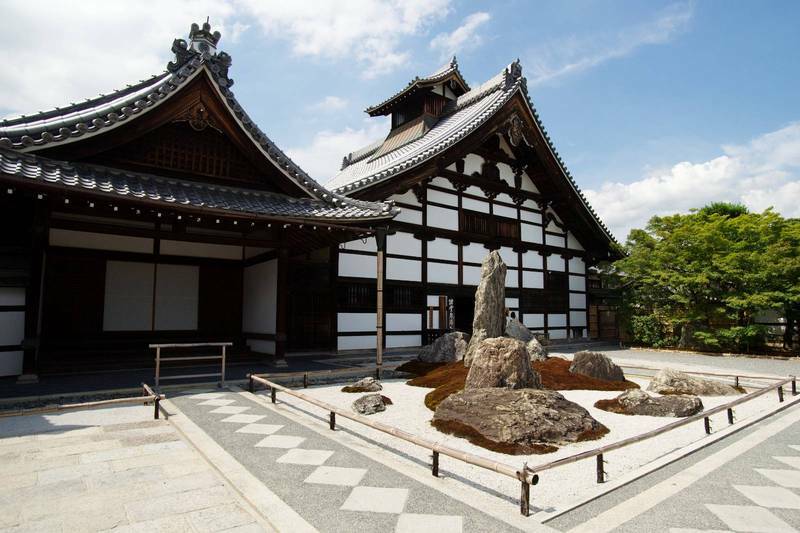 Around them there is a beautiful Zen garden, designed by the Zen master Muso Soseki in the XIV century. The foundation of this temple dates back to 1339, but most of the buildings date back to the nineteenth century. Just north of the Tenryuji there is a small forest of bamboo trees, crossed by some paths that lead to the Okochi Sanso Villa. The former residence of a famous Japanese actor of the twentieth century, Okochi Denjiro. It includes various buildings, which can not be visited inside, and a small museum dedicated to the actor. But the main attraction of this place are the gardens surrounding the buildings, designed with the idea of ​​representing the best of each of the four seasons. 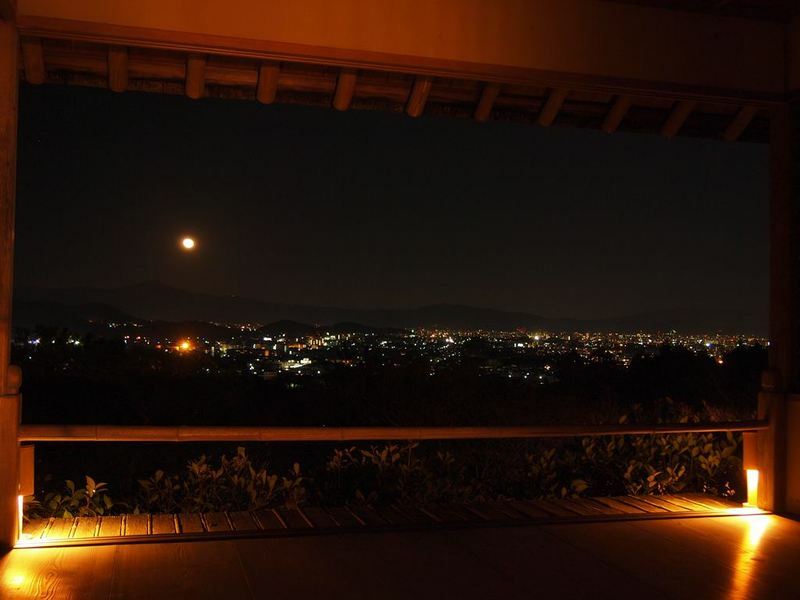 In addition, since the building is located on a hill, you can also enjoy a good view of the neighborhood and the city of Kyoto. 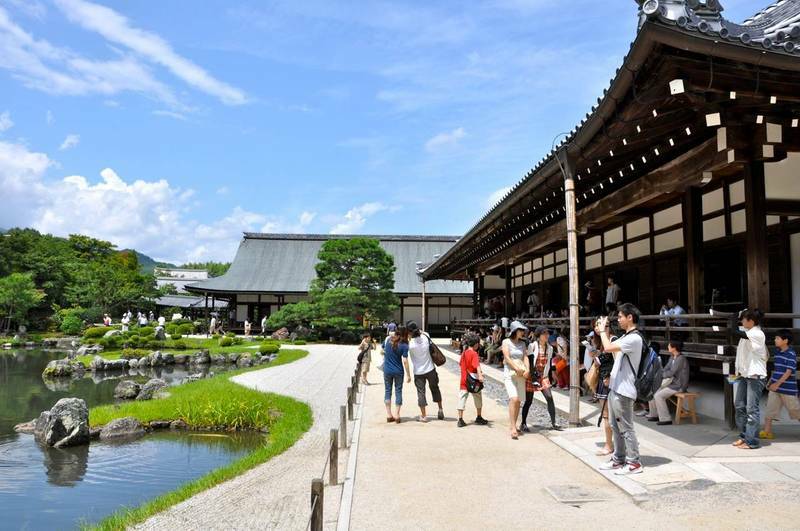 The price of the entry ticket is quite expensive, but it also includes a cup of green tea and a sweet at the tea-house within the villa grounds. 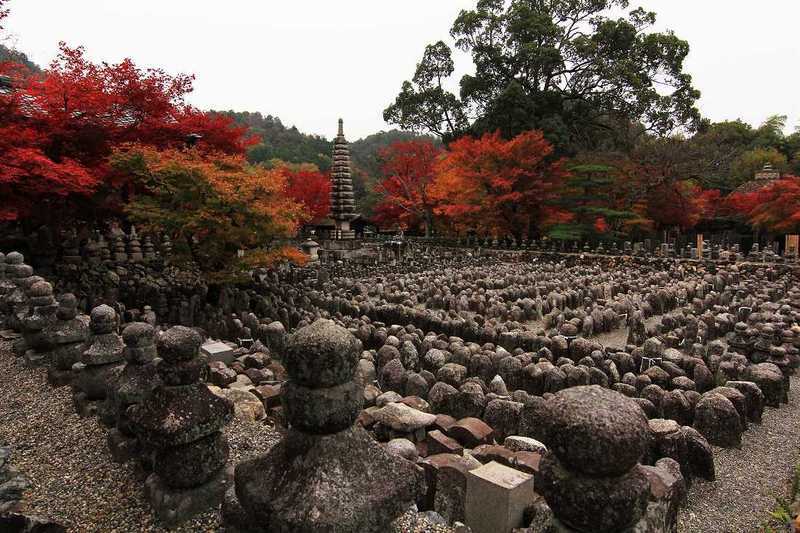 The whole area of ​​Arashiyama, as well as the rest of the city of Kyoto, is filled with many other temples and shrines. Within the bamboo forest you can visit a small Shinto shrine, the Nonomiya Shrine (free admission). 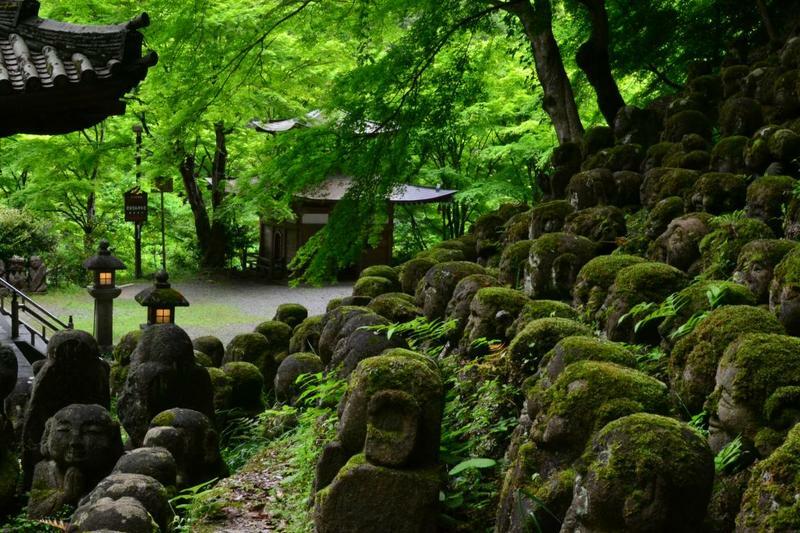 Continuing north, you can visit the Jojakkoji Temple, the Nisonin Temple, the Takiguchi-dera Temple, the Gioji Temple, scattered through the hills. 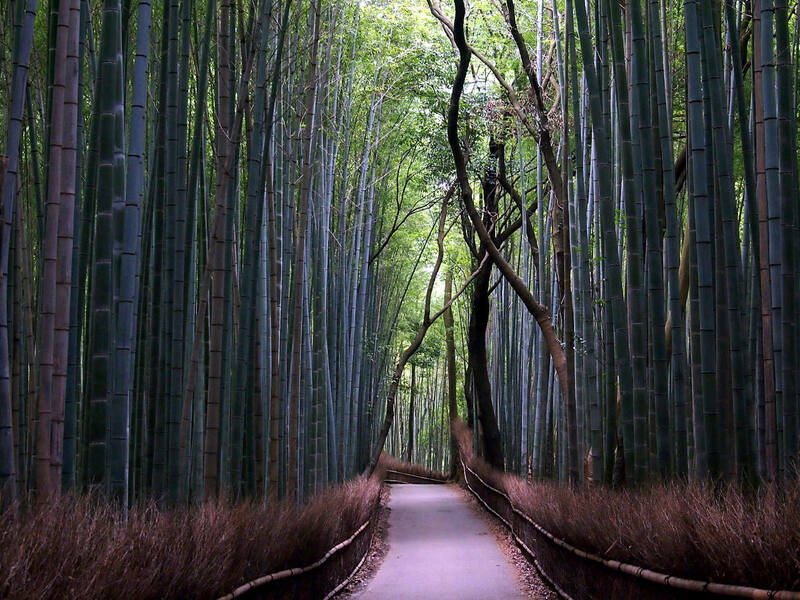 This area is located in the northern part of Arashiyama, about 2,5 km far from the Togetsukyo Bridge. 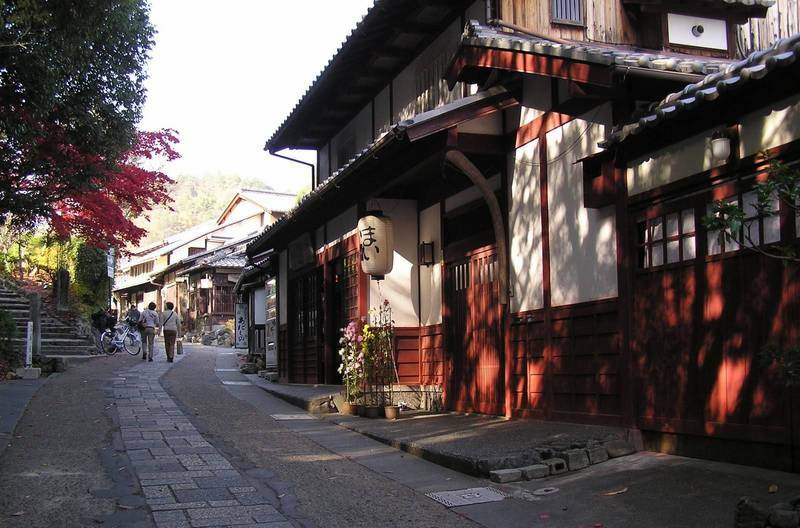 It is one of the "historic preservation districts" of Kyoto. The main street has been preserved in the style of the Meiji period (1868-1912), with several traditional machiya, the old merchants' houses, now converted into shops and restaurants. At the end of the street there is the Adashino Nenbutsuji Temple (admission 500 YEN, opening hours 9-17), a temple that is famous for the (about) 8000 Buddhist statues kept inside, carved over the centuries in honor of the dead who were left there. Continuing from the area of ​​Saga-Toriimoto north for about 700 meters, you can visit another Buddhist temple, the Otagi Nenbutsuji Temple (admission 300 YEN, opening hours 8-17), a little-known temple that contains inside approximately 1200 rakan, stone statues of "disciples" of Buddha, each of which is represented with a particular and curious expression. These statues haven't a great historical value, they were built in the 80's by various amateur artists. This temple, probably because of its isolated position, is one of the less visited of Arashiyama, but if you have enough time it definitely worths a visit. A very special place where to do something different from the usual visits to temples and shrines. 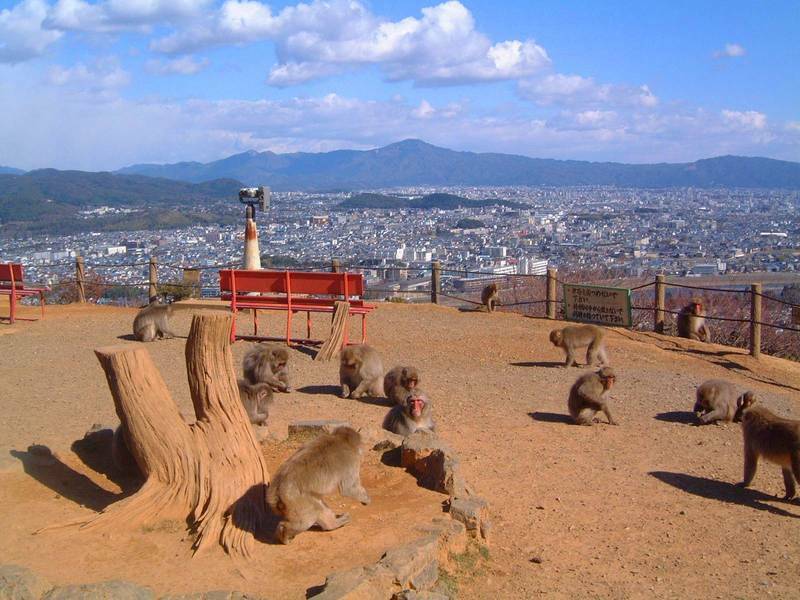 It is a park full of monkeys (Japanese macaques) that extends in the hills of Arashiyama, south of the Bridge Togetsukyo. There are about 170 free monkeys around the park, you will encounter several of them while going up to the top. 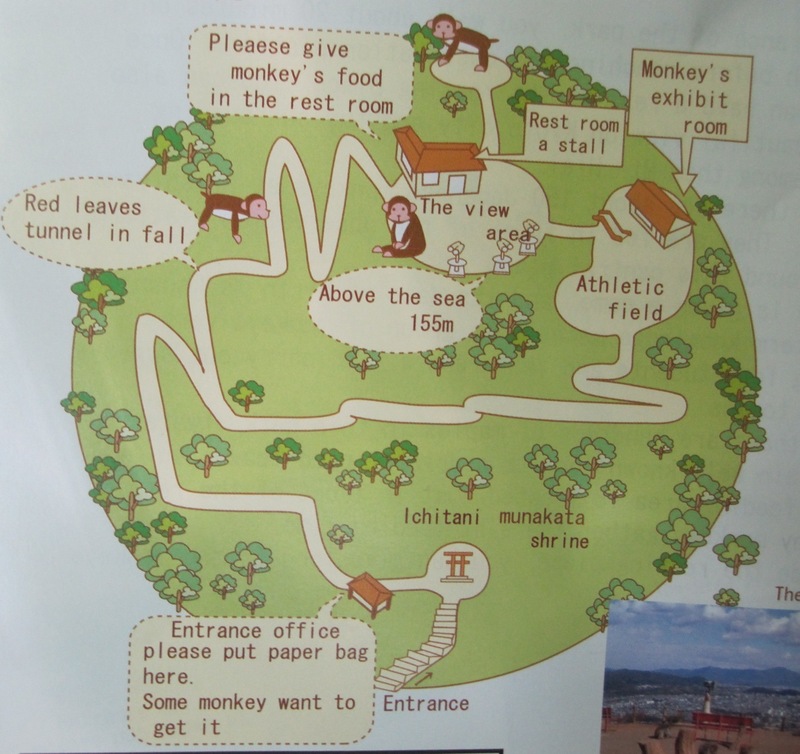 Once you reach the top (about 10 minutes walk), you can enjoy a good view of the surrounding area, and buy some food (100 yen per packet) to give directly to the monkeys in a designated area (in other areas is forbidden). Kameoka is a small town about 6 km far as the crow flies from Arashiyama, going up the river Hozu to the west. There are two "tourist" alternatives to go from Kameoka to Arashiyama, following very attractive routes right along the river surrounded by nature: by train (Sagano Scenic Railway) or by boat (Hozugawa River Cruise). Since the boat cruise, unlike the train that runs in both directions, can only be taken in a direction (from Kameoka to Arashiyama), many tourists usually do this tour: from Arashiyama they take the Sagano Scenic Railway to Kameoka, and from there they go back to Arashiyama taking the Hozugawa River Cruise. If you're interested in only one of these experiences, you can anyway reach Kameoka through normal transport lines, the area of Kameoka is in fact served by the JR Sagano line, which stops at Umahori station and Kameoka station in Kameoka town. 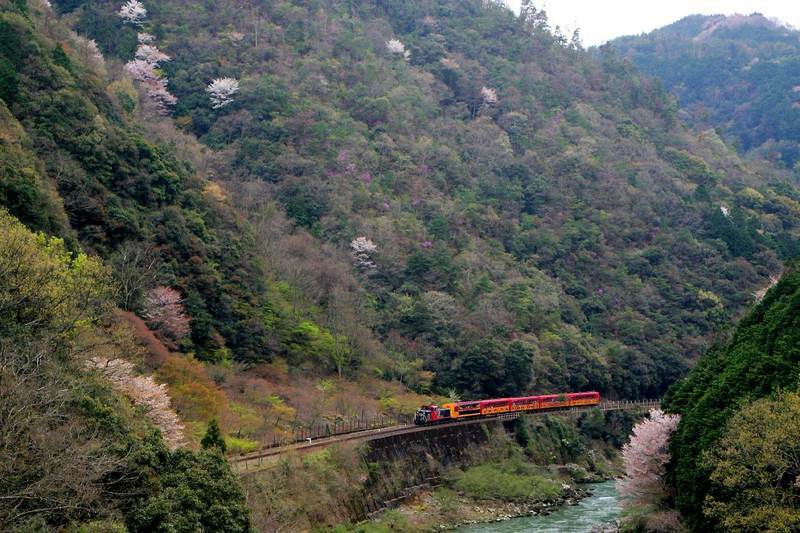 This train, also called Sagano Romantic Train, connects Torokko Arashiyama station to Torokko Kameoka Station, following a very spectacular route along the river Hozu, especially in autumn. The trains used on this line have an "old style" look, with wooden benches, and go at low speed to allow passengers to enjoy the view. Each train is composed of 5 cars, one of which is open-air. The whole journey is about 7 km long and and the trip takes 25 minutes. 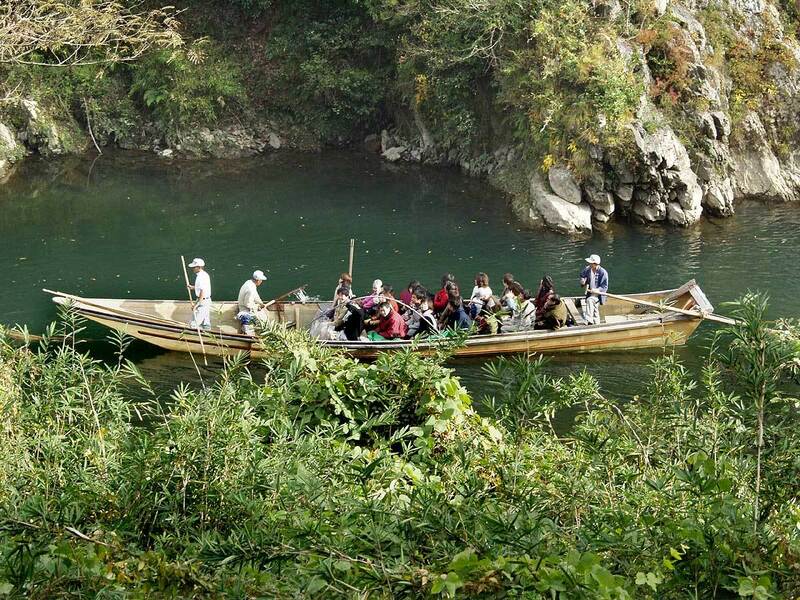 A "cruise" on the river Hozu that starts in Kameoka and go down the river to Arashiyama, for a total of about 2 hours. The boats used are traditional wooden boats, guided by some boatmen with bamboo oars, in a way that reminds that of the Venetian gondolas. The service may be interrupted in the event of heavy rain or other bad weather conditions, but usually boats depart also in the winter, even with light rain, they are heated and covered with sheets of plastic. Needless to say, the spectacle of nature that can be seen during the cruise is very nice and relaxing, especially in the fall. This is a very isolated area from the rest of the city, so it's not really the ideal location to stay. If you want to try the experience of staying in one of the most luxury ryokan of Kyoto (and also among the most expensive, at least 300 euros per night), maybe just for one night, you could try the ryokan Ryotei Rangetsu. -Arashiyama station (Keifuku Electric Railroad), served by the Keifuku Arashiyama Line. You can take this line from a station in the central area of Kyoto, Shijo-Omiya station (20 minutes, 200 YEN).